Xtratime Community > European Football > Italian Football > Inter > Which Ex-Inter Player You Still Pay Attention To? @Nacka : Guess who's #1? @pele10brazil : Check out that assist for Ibra. Nacka and Nerazzurri4life like this. Alex Telles sends Roma out of Europe. I guess I should mention Conceicao too. Wasn't too good at Inter though. Certainly better for Lazio in comparison. Roma having to play 2 more matches in the last 8 would have been good for us but now they have nothing but the league to play in..
Former Roma, Juventus and Inter striker Daniel Osvaldo will be a contestant on Ballando Con Le Stelle, the Italian version of Strictly Come Dancing. Born in Argentina, but spending most of his career and life in Italy, the forward retired at the age of 30 so he could focus full-time on his band, Barro Viejo. The singer will have to show off the footwork that earned him 14 senior Italy caps, scoring four goals. Now 33, his other clubs included Atalanta, Fiorentina, Espanyol, Southampton, Boca Juniors and Porto. The reality show Ballando Con Le Stelle is based on the original British format, Strictly Come Dancing, which was then sold all over the world as Dancing With The Stars. Osvaldo is an interesting guy. Remember an old article about him, he didn't seem overly keen on football, but he's happier now - found his true passion. What's with Inter's Treble stars ending juve's unbeaten runs? The Treble still haunting them..
Francesco Toldo was Inter’s representative in Singapore as the fixtures for this Summer’s International Champions Cup were announced. The Nerazzurri will play one of their ICC matches in Singapore against Premier League side Manchester United. Inter will also face Tottenham Hotspur as part of the competition. “Singapore is one of the most beautiful cities in the world, it is rich in values ​​and full of kind people,” he said. Toldo, who spent nine years on Inter’s books, went on to add: “Being in Asia is important for us as we are an international club in every sense. We like to be here to connect to the fans who follow us from afar and have less chance of being close to us. “Our owners are Suning, a very large Chinese company which is one more reason to feel close to this wonderful continent.” “. 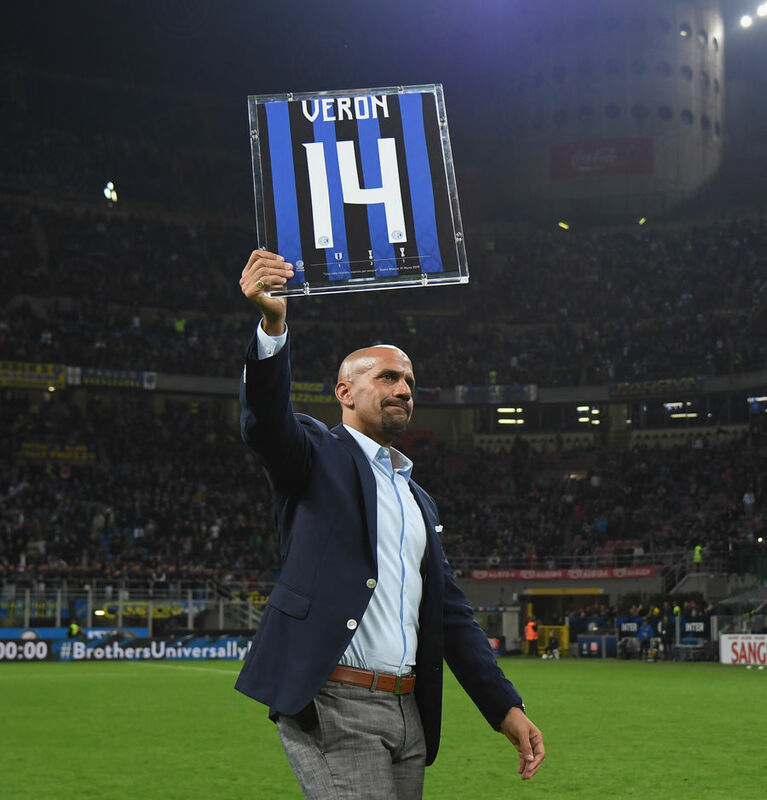 Veron and Cuchu in midfield, good times..
Ventola! Guy hasn't aged a day since he last played for us. Pinamonti assisted as Frosinone surprisingly won at Firenze in today's early Serie A kickoff. He will face Inter next weekend. Belfodil scored a hattrick as Hoffenheim won 4-0 at Augsburg today. I checked and Belfodil is now at 13 goals in the Bundesliga this season. Good figure. In other news Banega assisted as Sevilla won at Real Valladolid in La Liga. @Nacka: check this out. Best Djorkaeff compilation ever released. Belfodil scored twice and assisted once in Hoffenheim's 5-2 win at Schalke today. Schalke having a very poor season btw, 4th from bottom. 2 go down and 3rd from bottom plays against the 3rd placed team in the second division.